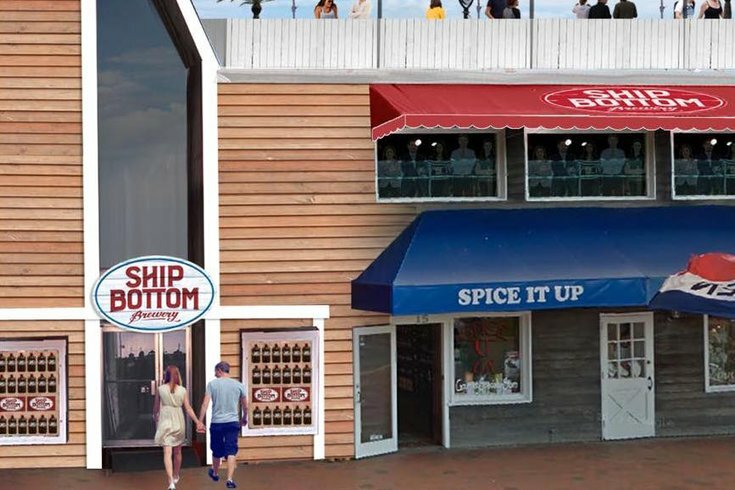 A rendering of Ship Bottom's new space on Long Beach Island. Ship Bottom, a Delaware County-based brewery, announced back in January that it had plans to open a brewery and taproom in Beach Haven on Long Beach Island this spring. Now, Philadelphia Business Journal reports that it has received enough funding to complete construction on the project at 830 N. Bay Ave. The new production facility — compared to its current "homegrown system" — will have commercially available equipment, a full taproom, a canning line, and the space to increase production to up to 2,500 barrels a year, [owner Robert] Zarko said. With the production facility, the brewery will be able to supply its distributors with kegs and cases for New Jersey, Pennsylvania and Delaware. Ship Bottom currently produces five year-round varieties -- four IPAs and a stout -- in addition to several seasonal varieties. Flights, growlers and six-packs will be for sale in the taproom, which is expected to open in June.